That was before Sabbatical Man and I had three lovely assistants: one small, one medium and one large. Our first bartering experience with the boys had been in the magical Grand Bazaar in Istanbul over a tiny wooden chess set that Small fell in love with. “Forty euros,” the vendor said, with a flourish that suggested that the box and its treasures had come directly from Aladdin’s cave. My Bartering Laugh tipped out like ice cubes into a dry glass. “No it’s not,” said Small, feet firmly planted. “I’ve saved up more than €100,” he proudly told the vendor. The vendor grinned benignly, feigning a momentarily lapse in English comprehension. I looked at the ceiling and appealed to a son-of-a-deity that I don’t believe in. The vendor, practising the preaching of a completely different religion, took pity on Small’s open little face and promptly offered a more reasonable price tag of around €10. 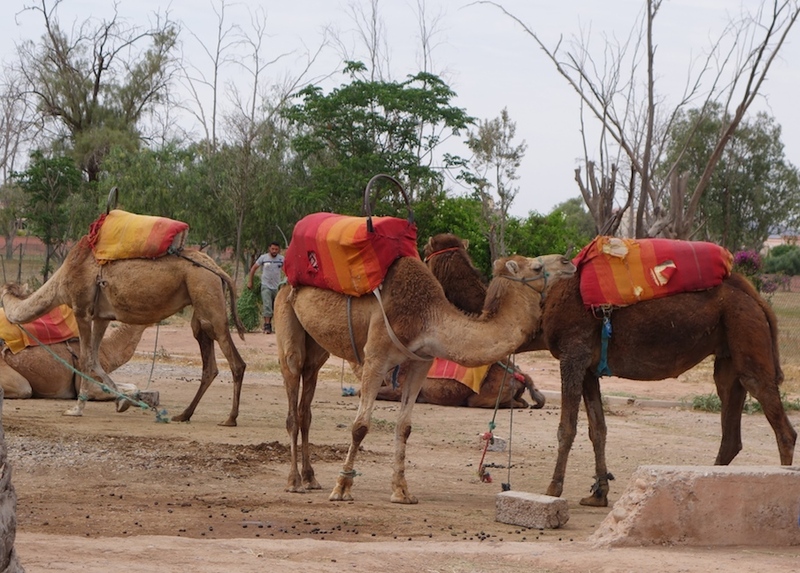 During one of France’s 42 long weekends in May, we grabbed some cheap flights to Morocco and this time explained more carefully to the kids about bartering: i.e. it’s not insulting to negotiate, it is part of the culture, initial prices are inflated and it’s wasteful to pay more than something is worth. The boys didn’t argue. We mistook that for listening. Medium was the first to buy something in the souk of Marrakech – a hand-carved “magic” wooden box. This line I have heard many times so I did The Laugh and prepared to knuckle down. “That’s fine. I’ve got enough money,” said Medium. This time Large tuned in. The vendor inched sideways so he could add his upturned face of innocence to the line-up of young males in front of me. This guy was expertly mimicking my kids’ facial expressions. Everyone looked so disappointed in me. Where was the Good-Natured Haggling and the Exchange of Laughter before the Exchange of Cash? The vendor could only agree. How did buying a trinket in a souk become all about poverty and ethics and the West and exploitation and setting a good example to children? The vendor saw the tremor in my Bartering Smile. “It’s a democratic price, Madame,” he repeated solemnly, sucking in his cheeks and hollowing his chest to look just a little hungrier. Large and Small did bigger Big Eyes. Playing the bartering game is all very well when you’re young, broke and childless. It takes on a whole new context when you’re living it up in the south of France and taking regular international holidays while also trying to instil in your children a sense of respect, empathy and generosity toward people who have less. 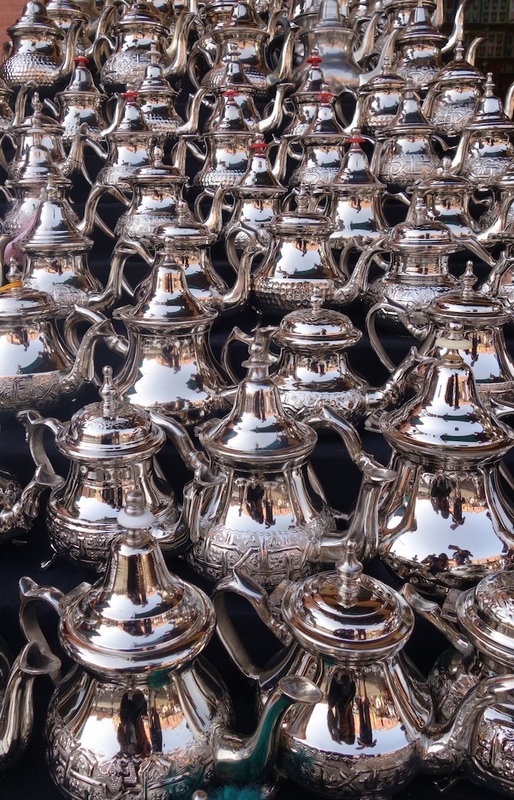 Our boys couldn’t understand why we don’t haggle over price with market vendors in France yet would screw down the little guy in Morocco who, in comparison, has nothing. I started to argue feebly that the market vendors don’t pass on the extra money to the women and possibly children who produce the tat for next to nothing but in that heat, no one was interested in an economics lecture and I wasn’t entirely convinced myself. I sighed and opened my wallet. Fortunately, it wasn’t just my world-view that was challenged in our four days in Morocco. I will never forget the boys’ faces on that first afternoon when we tumbled out of the taxi into the heat of the medina. Talk about culture shock. It was hilarious. It was 44° C with no shade in sight and we were assaulted with the odour of sewers, musk, sweat, tagine, cinnamon, horse dung and rose, the clatter of motorbikes, horses, hundreds of ancient yellow Mercedes taxis, exchanges in Arabic, French and English, the maelstrom of colour: rugs and pots and shoes and jewels and robes and plates and the people – lots and lots and lots and lots of people: vendors and tourists and office workers and beggars and school kids and porters. Sabbatical Man and I were in heaven – this is the sort of thing we love. Not so much three boys from the South Pacific who have never experienced the chaos of L’Orient. I knew Marrakech would be a challenge for Large, who finds excesses of any kind unbearable, but to his credit, he managed to switch his lemon-sucking expression to a more neutral look of moderate alarm. Medium and Small, squinting in the fan oven air, looked like someone had slapped them with a schnapper – and were relieved when we turned into a nondescript door and entered the cool and Morocco-chic of the riad where we would be staying for the next couple of days. Our host brought us tea and sweet treats and encouraged the boys to make themselves at home – which they were very happy to do with an abundance of cushions, games and sugary foods on offer. After a breather, we dragged all three back outside to explore. The souk is heaven. Food for the eyes and stomach in every direction. Two women are kneading and stretching and patting bread dough onto a hot plate. A grotesque line of of headless child-sized mannequins are hanged from a stall. A street vendor steers his cart through the tiny alleyways selling warm, chewy, coconut biscuits that melt in the mouth. The stalls in the main square offer fresh squeezed orange juice. Snake-charmers do their thing. A man has lined up hundreds of human teeth on his display table. Why? Apothecaries (or are they alchemists?) are touting their wares, encouraging the children to inhale this and taste that. The vendors forget to do their hard-sell on us. They’re too busy trying to make the kids laugh – asking to borrow Medium’s binoculars, begging for a taste for Small’s biscuit, tapping Large’s shoulder and looking away in apparent innocence. The boys suffered in the heat but were fascinated. With regular stops for cold drinks and delicious snacks, they could cope. 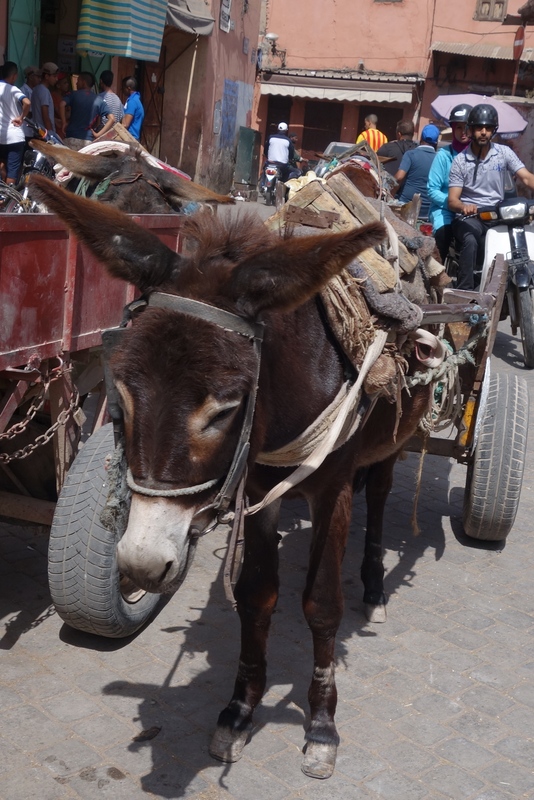 That night our host suggested hiring a horse and cart in the morning to scoot between the main tourist sights of Marrakech. We thought it sounded corny but lots of walking was out of the question in the heat so we said yes. It turned out to be the perfect way to get around – with natural air conditioning, excellent visibility and manoeuvrability. Our driver was as dry as the desert, coolly wise-cracking his mates all around town as he zoomed us about with minimalist explanations in French of Marrakech’s architectural and historical treasures. “This is the Koutoubia Mosque. You come out that side.” “This is the Majorelle Gardens. Very beautiful. You come back here in 20 minutes.” “That is the railway station. It is new.” “This is the Hilton. You can take a picture here.” Best tour guide ever. 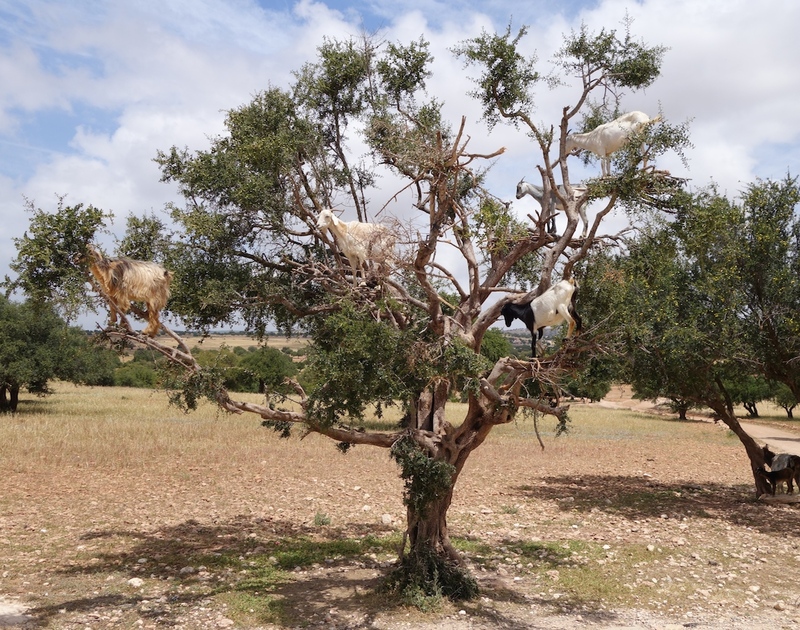 On the third day, we headed to the coast, stopping at the classic goats-in-the-tree photo op on the way. Essaouira was a few degrees cooler and we were staying at a lovely B&B with an enormous swimming pool and a bonus litter of tic-ridden but otherwise healthy puppies to play with (a New Zealand vet who had been staying there enlisted our boys as assistants to help him remove dozens of tics from the ears of those poor pups before heading off). It was a perfect base from which to explore this small coastal town with charming white and blue architecture, mini-souk and thriving fish market. I always ask before taking pictures of produce (let alone people) in markets and loved the dry response of one man at the Essaouira fish market who gave a quick nod and said: “Les poissons, pas le moroccain [the fish, not the Moroccan].” His fish, not his person, appear in the photos below. wow wow and wow!!! sounds soon good, I want to go! M a r v e l l o u s.
Yay, to read your stuff again 🙂 Great photos, too, Karen. Karen – your photos and stories are fabulous. Please, please put all your blogs and photos into a book for all to enjoy.